from high on the route revealed their mistake. The cols north, south and between north and south Spilt Peaks can be reached via steep scree or snow, via Black Birch Creek. From the broad, prominent scree slope that leads to the col on the northern side of the Split Peaks, traverse along a short ledge to a loose, rocky gully. Follow this gully to the summit. Start by climbing the broad, prominent scree slope, aiming towards the col on the northern side of the Split Peaks. Well before the col, climb a steep, narrow, rocky gully that emerges from between the buttresses of the Split Peaks. After a short step, this gully leads to a narrow col between the Split Peaks. From here, clamber over steeply-stacked loose blocks to the summit. 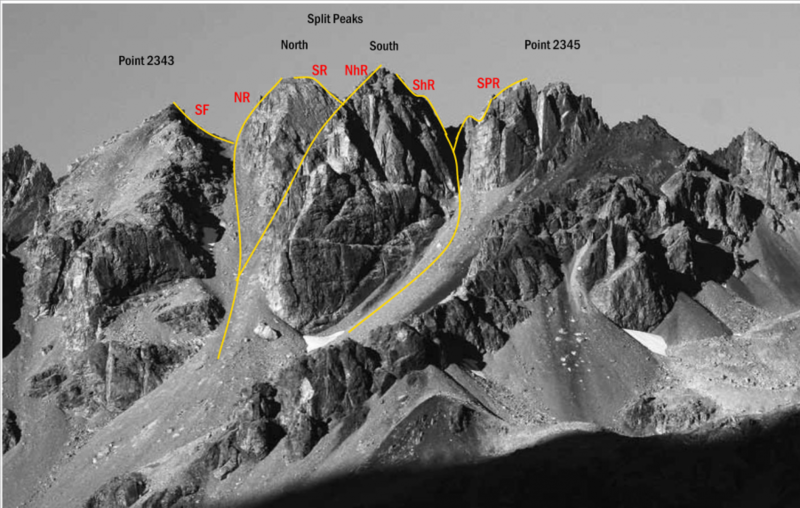 Gain the narrow col between the two Split Peaks (see South Ridge of North Pk, route above). Climb a short slab and loose rock to the summit. Climb a steepening gully immediately south of the peak, to a small col. Negotiate a short step before moving right and climbing loose rock and boulders to the summit.